Continuing from last week’s first article on hypertrophy, this week we are going to look at a similar study. However, this time the research was conducted over a 10-week period. 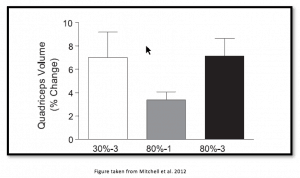 Longer term training studies provide more significant evidence of a training effect. Once again, this data comes from the McMaster University research group, headed by leading protein metabolism and muscle physiology researcher Stuart Phillips. Why they did it: 18 recreationally active, younger men performed 10-weeks of single leg training, three times per week under the following three conditions: 1 set x 8 reps of a knee extension performed to voluntary failure at 80% of 1RM; 3 sets of knee extension performed to the point of fatigue at 80% of 1RM; 3 sets performed to the point of fatigue with 30% of 1RM. Three minutes rest periods were provided between each set. What they measured: Synthetic protein rates via muscle biopsies and muscle volume via MR scans. 1RM knee extensor muscle strength was also measured. What they found: The lower load, higher repetition sets were equally as effective as the heavier load, lower repetition sets at increasing lean muscle mass in the quadriceps. What is even more impressive, is the lower load, higher repetition group improved their 1RM strength, despite using 50% less weight! What does this mean: Similar to the recommendations provided in last weeks article. The findings of study show coaches and fitness trainers who prescribe resistance training exercises to fatigue, with approximately 30% of 1RM, three times per week may be able to induce similar improvements in muscle size and strength as a more traditional resistance training program that focuses on heavier weights and lower repetitions. However, further research is needed to confirm if these results would occur with functional exercises which utilise kettlebells, suspension cables, functional bags or battling ropes. Reference: Mitchell, C. J., Churchward-Venne, T. A., West, D. W., Burd, N. A., Breen, L., Baker, S. K., & Phillips, S. M. (2012). 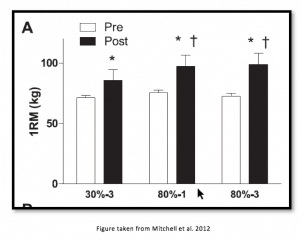 Resistance exercise load does not determine training-mediated hypertrophic gains in young men. Journal of applied physiology, 113(1), 71-77..